November 5th and over 100 designers, technologists, usability professionals and public attendees gathered at the NIAS Auditorium at the Indian Institute of Science, Bangalore. The event: World Usability Day, which was founded to ensure that the services and products important to life are easier to access and simpler to use. 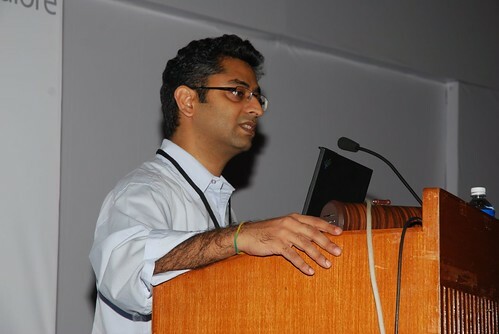 Organized and supported by UPA Bangalore, CHI Bangalore, leading usability companies, and usability enthusiasts, the event focused on Healthcare, Education, and Government Services and other public services and utilities that touch our lives everyday. 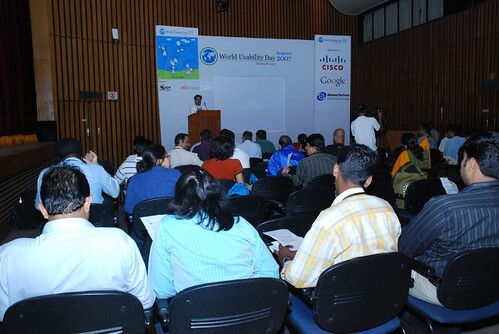 The event kicked off with an introduction to the World Usability Day. The five-hour long event included talks and presentations by experts in the field, the results of usability testing of a public services website, and a very engaging design workshop. Dr. Girish Prabhu, director for design research and innovation for Asia in Intel’s emerging markets platform group, shared key perspectives on the design of the Community PC. He highlighted the importance of understanding stakeholder needs and conducting ethnographic studies while designing products, the lack of which resulted in the failure of the Community PC. Prof. M.P. Ranjan, member of the Faculty at the National Institute of Design, Ahmedabad (NID), India, and Chair of the Task Force on GeoVisualization set up by the Government of India spoke about how design is about real world contact and the need for rethinking so that design has social equity. His presentation titled Towards an Accessible World – Opportunity for Designers also spoke about how designers should cater to each individual, since each individual’s needs are specific and different. 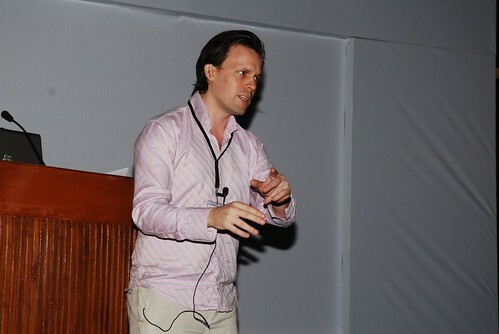 Sean Blagsvedt, CEO of Babajob.com, spoke about how an innovation can fight poverty in a scalable fashion. 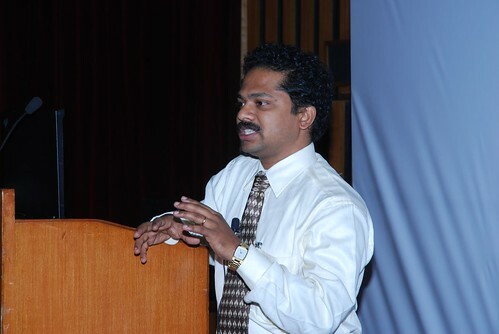 His presentation also covered on the HCI aspects of the site and how it helped in reaching out to non-computer literate users. Dr Reynold Washington, the Director STI, HIV Care and Surveillance at Karnataka Health Promotion Trust (KHPT) and Gururaj H, Sr. Officer at KHPT highlighted the various initiatives undertaken by the KHPT to make a positive impact on the health of populations in India. Sanctioned by the Government of Karnataka, with the University of Manitoba, Canada as the implementing agency, KHPT, through research and innovation, training, and capacity building, aims to develop better technological strategies towards HIV prevention, care and support. Sarit Arora from HFI presented the results of usability testing conducted on a public website, the IRCTC site of the Indian Railways. The key results of this test were that while most people found the service useful, they were frustrated using the site. 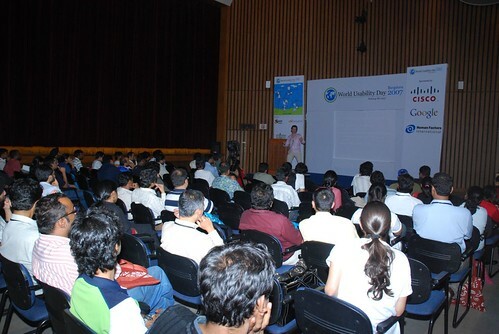 Usability issues faced by the test participants were effectively shown in the form of videos to the audience. A design workshop was conducted in which the audience enthusiastically participated. Split into teams, the participants were given public service scenarios and a problem statement. 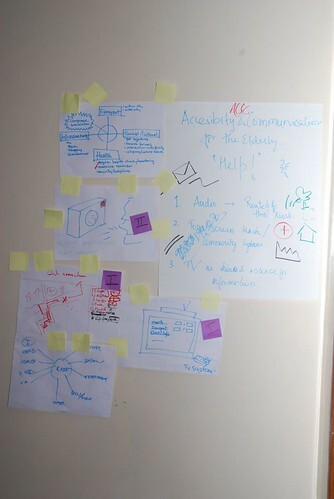 The teams had to then brainstorm and design a solution within the specified time frame. The solution then was presented to a panel of judges. The workshop saw a buzz of activity, with participants excitedly working together towards one common goal – to design the best solution. The results were announced at the end of the day and prizes presented to the top three solutions. Nice talking to you yesterday. WUDBE 07 was very well organized and we(myteam) had more informative stuff and good time in participating in workshop. Couldn’t stay more than 7.30PM as i had a train to catch @ 9.30PM. I was there. There was a good gathering in spite of low advt in media. Very very informative.